A ceremony took place at the school on Tuesday (January 29) to mark the opening of the new facilities. Year 3 pupils sang ‘Build it High’ before a plaque was unveiled by site manager Neil Harding and the eldest year 6 pupil. 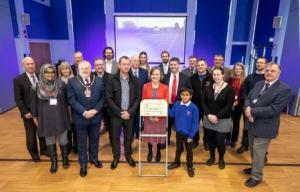 Headteacher Sarah Phillips, chair of governors John Brady and Wokingham Borough Mayor Cllr John Kaiser all gave speeches to make the occasion. The ceremony ended with the choir singing ‘A Million Dreams’ before invited guests enjoyed a tour of the school.